This little guy looks like a Bark Louse (order Psocoptera). If it is, can anyone narrow it down a little? I have been studying the Texas Indiopsocus species for several months and I am a bit wiser now. After dissecting some specimens sent to me by Robert Zimlich from Mobile I realized that his specimens were not I texanus. Your posting is now the only one of Indiopsocus texanus. I would LOVE some specimens of this species! If you encounter any more please send them in alcohol and you will promptly get a box of homemade cookies. Did this one come to a light trap? Moved from Barklice and Booklice. 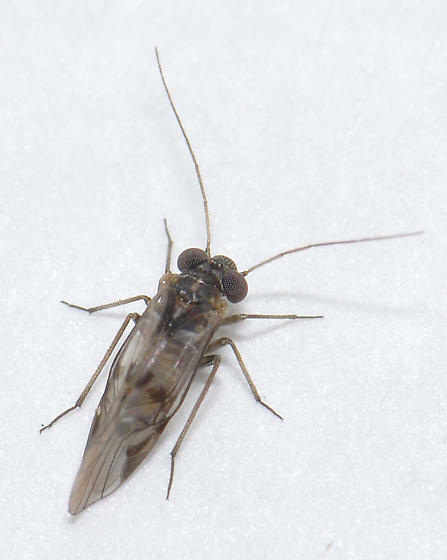 This is certainly a member of the family Psocidae. Wing venation is my preferred character for this family but the size, shape and facial markings are all indicative of species within this family. I am working to understand the facial markings for this family but at the moment can't take it farther. This is another big eyed male (for finding females). Can't narrow it down myself, but moving to order page where perhaps someone else can.